Bringing a newborn home is one of the most wonderful experiences. Finally after the long wait, your baby is truly part of the family. Unfortunately you are truly on your own now as a family – no nursing staff to give you a much needed nap or cup of tea whilst breastfeeding, and of course no one with advice on tap. You are tired after your first day visitors and settling in with bathing baby at home and the constant feeding and changing. Babies are hard work. Just as you finally put your head on your own pillow you hear a cry from babies room. This is the beginning of getting up – changing, feeding and settling baby, getting back into bed, just falling asleep, getting up, changing, feeding, settling baby, getting back into bed… You get the gist of this. It is one of the facts of life that most babies need feeds every three to four hours for at least the first two months of lives. After three months of this routine you and your husband will truly be exhausted, with reason. Usually after month three parents are faced with the dilemma of how to get your baby to sleep through the night in order for you to get some zzz’s as well. A less tired mom makes a more tolerant mom the next day! Not such an easy task – be careful who you voice your opinion on the issue to. There are two very different opinions about how to go about this important task. Some people believe firmly in teaching the baby to fall asleep unassisted, and other believe just as firmly that it is a parent’s role to help soothe a baby to sleep. Parent soothing vs. Self soothing. Parent Soothing involves mommy nursing, rocking or singing baby to sleep. The advantages of parent soothing is that it helps your baby develop a healthy attitude about sleep. Sleep is not seen as punishment, but rather something that is pleasant. Above all it is a wonderful opportunity for bonding. The disadvantage of parent soothing is that your baby will not be able to fall asleep without you or any props that you might use to get her to sleep. Self Soothing refers to parents who only give intermittent comfort to baby, but is not present when baby actually falls asleep. The advantage here is obviously that baby will learn to fall asleep by herself and will be able to put herself to sleep again if she should wake up during the night. The disadvantages is that the “cry-it-out” technique is very stressful to both baby and the parents. Baby might feel that she cannot trust her parents to be there for every need. Sometimes parents might be overlooking a real medical reason for baby being unable to sleep. Self soothing might lead to parents being less sensitive to baby’s cries. I think we should realize that there is no one recipe that will work with all children. There is also not one recipe that will always work with one child. Babies and parents are all made unique and therefore their interactions will be unique. Do not listen to other people, do what feels right to you and what works best for you – anything that will give both you and baby the best quantity and quality of sleep. Remember there are no rules about where baby is allowed to sleep, and how to get her to sleep.It is important though that parents should agree on how to handle this difficult issue. Realistic Attitude: Try to remain realistic in your expectations. A realistic attitude will assist baby to develop a healthy attitude towards sleep, which will be beneficial for the rest of her life. Sleep should be seen as pleasant and baby should feel secure when sleeping. Daytime Mellowing: A baby that is calm during the day, will be calm at night. Stimulation is good, but over-stimulation will spill over into night time leading to a restless sleep. Babies that are carried and held a lot during the day feels secure and loved which in turns make sleeping at night easier. Predictable and Consistent Naps: Pick times of the day when you are most tired for example 11 and 4. Lie down with baby at these times for about a week to get her into a daytime nap routine. Babies who have decent naps during the day sleep for longer stretches at night. Use the naptime to also get some much needed rest. Filling the Tummy: Babies should learn that daytime is for eating and night time is for sleeping. A baby that has sufficient food during the day will be able to go without food for longer at night. Bedtime Routine: A consistent routine of bathing at night, cuddling and feeding leaves the expectation that it is sleeptime. A predictable routine calms a baby and gives security. Nursing down: Nursing down refers to baby falling asleep at the breast or with a bottle, or becoming sleepy enough to put into her crib and fall asleep on her own. Fathering down: This is when dad lets baby lie on his chest and put his chin on her head. His breathing and deep voice will soothe baby enough to fall asleep or calm enough to go to bed. Rocking/Walking: Rocking or walking with baby will soon lead to sleep. Nestling down: Some babies cannot fall asleep on their own. Nestling down refers to a parent having to snuggling next to baby until she is asleep. Wearing down: A baby sling or carrier gives baby closeness and movements which is very calming. Swinging down: Mechanical swings or chairs can help babies fall asleep, swinging and vibration has always been very effective. Driving down: If all else fails putting baby in the car and taking her for a drive can help to get her to fall asleep. If she wakes very easily keep her in the car seat until her first night feed. Swaddling: Most babies feel secure when they are tightly wrapped up in a cotton blanket. The contrast between loose clothes worn during the day and being wrapped tightly at night will teach baby to associate swaddling with sleep. Quiet Bedroom: Baby’s bedroom should be quiet without sudden loud noises. Even though the bedroom should be quiet, it does not mean that the whole house should be muted. Darkness: A dark room will help a baby to sleep better. Block-out blinds will help to stop your baby from waking when the first rays of sun appear. 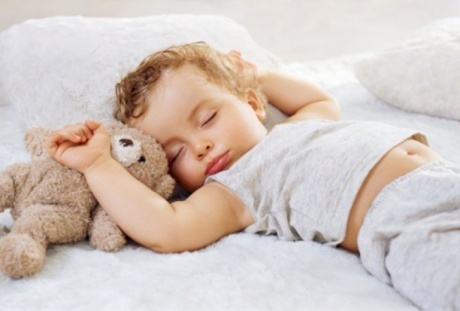 Sounds to sleep by: Some parents like to provide lullabies for baby to sleep to or other white noise. 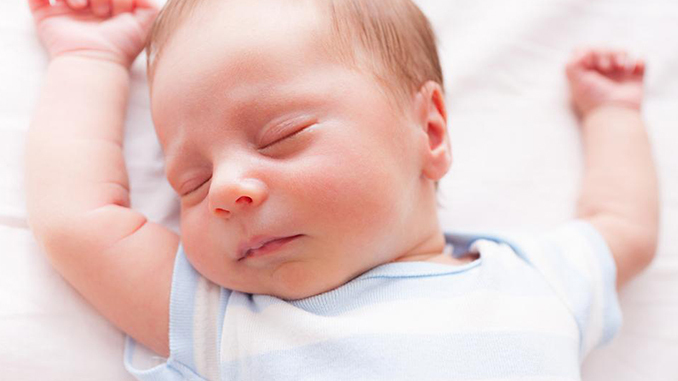 Baby will start to associate sleep with that particular sounds. Remove physical discomforts: Make sure that your baby’s nose is open, that she does not have a wet or soiled nappy and that her sleepwear is not irritating her. Warm bed: Placing a warm baby into a cold bed lead to a rude awakening. Put a warm water bottle on the sheets to warm up the bed before bedtime. Gentle patting: I find the faster you get to baby, the easier it is to soothe her back to sleep. Gentle rhythmical patting on her back or bum will quickly help her to fall asleep again. Stay in room: Staying in the room when she gets herself to sleep again will help her feel safe. Attachment objects: Dummies, blankies or any other attachment object can help her to fall asleep quickly. Cry it out: This is the self soothing approach to getting her to fall asleep again. Baby should get used to falling asleep again without assistance within four days. You can either stay in the room with her or leave and come back every now and then just to reassure her that you are available. If you do choose this route it is important not to pick her up, or you will have to start all over again. You do not want her to learn that if she continues crying she will eventually be picked up. Getting baby to sleep should be a team effort with both mom and dad equally involved. Good luck!